Garden Cottage is perfect for couples who want to experience Kauai on a budget. This 400-square-foot air-conditioned studio may be one of our less expensive vacation rentals, but it has the same luxurious feel as our larger accommodations. Originally constructed in 1952, we’ve fully renovated this adorable cottage to include air conditioning, hardwood floors, a tile shower for two, and contemporary tropical decor. As with all of our vacation rental cottages, its vaulted ceilings and plentiful windows lend a sense of warmth and spaciousness. This studio is ideal for stays of a week or more. Many of our guests use it as a home base since we are located halfway between the North and South Shores. 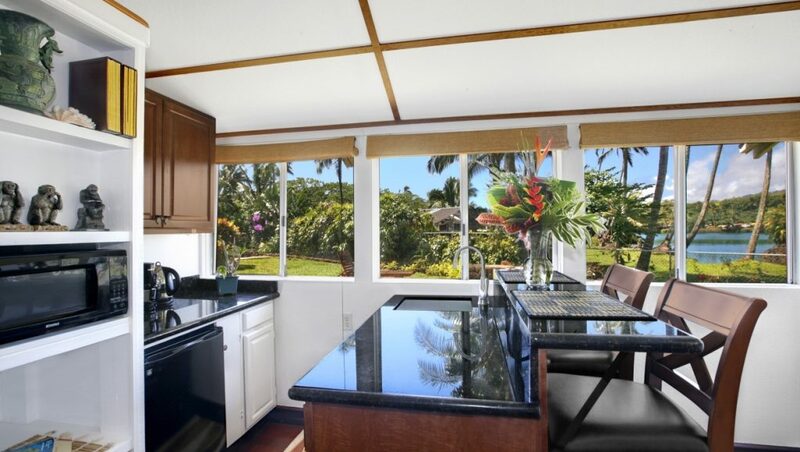 If you need to stock the fully equipped kitchenette, you’ll find several of Kapaa’s markets less than a five-minute drive from Fern Grotto Inn. and a one-time cleaning fee of $140 plus tax of 14.962%. With its budget-friendly rate and cozy feel, the Garden Cottage always books quickly. Reserve your dates today!